Fig 1. Up: skeleton of T Rex ("Sue"). Below: skeleton of Giganotosaurus. Sources: Wikimedia Commons (public, free media). 1. Why Giganotosaurus versus Tyrannosaurus Rex? 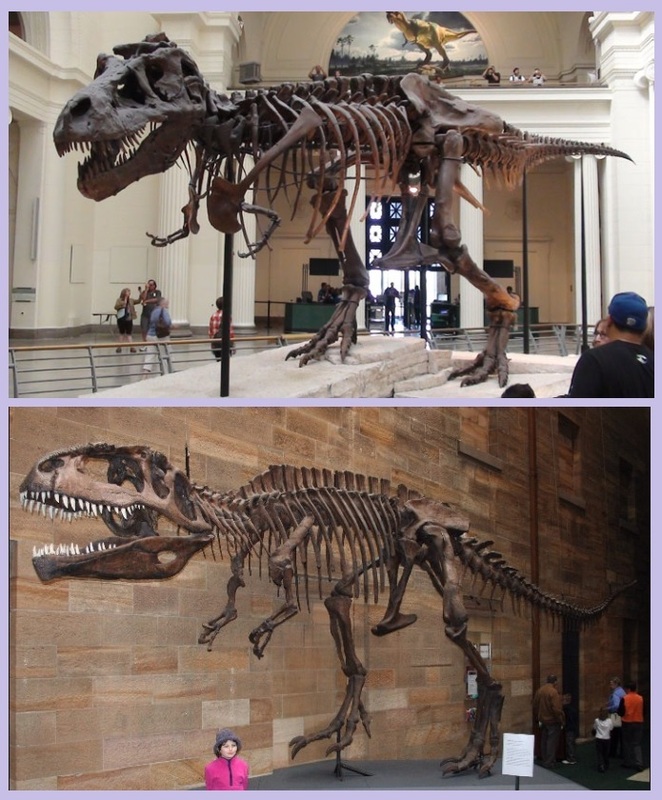 Maybe it's boring stuff, but I like to compare Giganotosaurus and Tyrannosaurus Rex. I will explain "the why". Ofcourse, TRex was a very powerful Predator, possibly the strongest of all. But.., what about Giganotosaurus? Everybody knows T Rex. Maybe Giganotosaurus is slightly lesser known. and estimations of it's dimensions vary quite a bit. Still, many think that it is one of the largest (maybe the largest after Spinosaurus) land Predators. Carcharodontosaurus, Sarcosuchus, Deinosuchus, Spinosaurus, Giganotosaurus, and T Rex. Or was it not...? Some say that the first place should go to Giganotosaurus instead. About the list: A few would say that Mapusaurus and some other "croc-like" (other than "Deinosuchus") are missing. would absolutely insist that these were great candidates too. Those folks might be right. It's true. For example the found specimem AMNH 5767 (Espanterias Amplexus) is estimated to be 12m of length. Sure, not everybody keeps (or likes) the listing, or same "ordering", ofcourse. Most of the animals were seperated by millions of years, so most have never met the other one. However, some did! some of those intruiging uncertainties. But first, here are some arguments why I like the discussion to be focussed on Giganotosaurus and T Rex only. Note: this text deals on large prehistoric "predators" only, and not herbivorous large dino's (not the vegetation eaters). of well over 9 tons. Some paleontologist would go for a slightly shorther lenght, like 15m. that those numbers "fluctuate" a bit, but really, most consensus seems to hover at about 15m and 9 tons. that converted to an real aquatic animal (that hardly came to land anymore), means that I like to leave Spino out of the equation. It mainly roamed in lakes, rivers, and possibly tidal waters, in North Africa. The latest "interpretation" is even better compared to the original one. Several prehistoric "super" croc-like predators walked/swimmed the Earth, most notably "Deinosuchus" and "Sarcosuchus". out of the discussion as well. "Deinosuchus", "Sarcosuchus", and "Spinosaurus", were non-marine animals, meaning not inhabitants of the oceans and large seas. Ofcourse, all three visited rivers, lakes, and other small waters, and both the croc-like animals, all sorts of swamps too. Sarcosuchus, Deinosuchus, Spinosaurus, Giganotosaurus, and T Rex. but that's ofcourse not a fully satisfying argument, ofcourse). they are really a class below Giganotosaurus and Tyrannosaurus Rex. But do I really have all candidates (from prehistoric land predators) in sight here? For example "Mapusaurus" was a close relative of "Giganotosaurus", and the data on this animal is not fully complete. Most experts would say 'no', since conclusive evidence is absent. I guess that I only want to say that the jiggsaw puzzle is not completely solved yet ! Anyway, for now, I will compare two really "established" champions, that is, Giganotosaurus and Tyrannosaurus Rex. Ofcourse, this has been done by others millions of time before. But I like the subject, and that's mainly "the why". Besides that, I was really amazed by the fact that many folks, did not knew Giganotosaurus at all. 2. The "data" of Giganotosaurus and Tyrannosaurus Rex. 2.1 Findings of Tyrannosaurus Rex. T Rex lived in a period from 70, to 65 millions years ago, in an area now called "North America". In total maybe around 20 (or so) skeletons have been found, of varying degrees of completeness. Ofcourse, it all depends on what you understand to be "varying degrees of completeness". are just collections of fragments. a certain overall impression of T rex, but which was not fault free. The holotype of T Rex was a partial skull and partial skeleton first labeled as AMNH 973, discovered in 1902, in Montana. The lenght was measured to be 11.9 m, and it's weight was estimated to be 7.3 tons. A few later highlights are the following (not complete). They lead to a more accurate picture of T Rex. for musea's, or Natural History displays etc..
- In 1988, Kathy Wankel discovered another Tyrannosaurus rex in Montana. including a complete skull. The specimem (MOR 555) was later nicknamed the "Wankel Rex" (or Devil Rex). - In august 1990, Susan Hendrickson discovered (by accident) a rather complete T rex (about 73%) skeleton, in South Dakota. The later reconstructed animal, was nicknamed "Sue". (FMNH PR 2081) was genuine. 1987: T Rex "Stan", 63% complete. 1988: "Wankel" T Rex, 80-85 % complete. 1990: T Rex "Sue", 73% complete (other sources say up to 90%). 1998: T Rex "Bucky", 34% complete. 2001: T Rex "Jane", 50% complete. is believed to have operated in packs, and presumably targeted on T rex juveniles. But many paleontologist do not agree, and they say that the socalled Nanotyrannus, is just a juvenile T Rex. This puzzle is not completely solved. to the 'Leidse Natural Museum' "Naturalis", located in the city of Leiden, The Netherlands. is enormous. Secondly, something which is quite rare, is also quite valuable. The further preparation and restoration is under the supervision of the "Black Hills Institute" (Montana). except for Stan, Wankel and Sue. Hopefully it all works out ! If so, it will be at display at "Naturalis" maybe as early as 2016, or possibly in 2017. For sure, I will be one the first visitors. Then, next to the USA, only "The Dutch" will be able to show a real T Rex to the public, which is great indeed ! Generally, it is quite accepted among the scientific community, that Giganotosaurus lived about 100 million years ago. That's way more back in time compared to T Rex, which roamed around in the period 70 - 65 million years ago. Paleontologist say that T Rex is actually pretty well documented, compared to many other dino's like Spino. Indeed, also the number of findings of "Giganotosaurus" are absolutely quite a bit "smaller" than those of T Rex. The data of Giganotosaurus is very low, as we will see below. The first (relevant) findings were found in 1993 by Ruben D. Carolini, in Patagonia, Argentina. to get "some sort" of a reasonable impression of the animal. However, some paleontologist say that "a good impression"
is out out of the question with this sort of low volume of data. Just before (1988), parts of another skull was recovered, especially a large part of the lower jaw. So, up to now, only two discoveries were made. Possibly, in 1998, more fragments of fossils of different sizes were found in the same Patagonian regions of Argentina. But I could not find further confirmation on this. I wonder if that is true. like those of the limbs and backbone. Several results goes around, typically ranging in a length of about 12m to slightly over 14m. That analysis can be very difficult proves the estimations of the skull dimensions. Those findings ranges from about 1.53 m to 1.95 m.
If true, then Giganotosaurus would be, in general, slightly larger than T Rex. But the latter statement is doubted by many scientists. bite force, what we can learn from the jaws, and other properties like those of the skull and orientation. 2.3 Data and hypothesis on T Rex and Giganotosaurus. => Theropods (like T Rex) were likely to be "energetic" and "warm blooded" animals. had quite an active live style (as we really think it had), then an ectothermic (cold blooded) physiology could not sustain that. Or at least, they had some sort of intermediate physiology, named 'mesothermic'. But they were not cold blooded. believe it was quite an active one. they could not perform enough to sustain themselves. might expect from a large mammal. This hypothesis however, is not fully accepted yet by all the experts in the field. It seems that quite a few are "contra". => General statement on the dimensions of T rex. some fairly accurate statements can be made on T Rex's dimensions. An average healthy adult T Rex could reach (at least) a length of 12m and (at least) a weight of 6, 7 tons. Period: Late Cretaceous period, at about 70 (or maybe 67) to about 65 million years ago. weight: An healthy adult could be at least 6 tons. Some folks sit higher like 7 tons. Length: An healthy adult was at least 12 m.
Bite force: Some say 3 to 4 tons. Might even be as high as 5 to 6 tons. => Did T Rex hunted in "packs"? A few scientists (Curie) proposed that T Rex actually might have hunted in groups or "packs". were found in close proximity. Although still no absolutely convincing proof has been found, the fact that in 2014 "T rex trackways"
might have been identified, is a strong point in favor of the "pack" behaviour of T Rex. If true, then the most powerful animal on the land has finally been identified: T rex. Period: Late Cretaceous period, at about 100 (or maybe 99) to about 97 million years ago. Location fossiles: South America, Patagonia, Argentina. weight: An healthy adult is often estimated to reach 8 tons. Length: An healthy adult is often estimated to have a length up to 13 m.
The holotype: MUCPv-Ch1 Found in 1993. Length ?, weight ? But estimated to be slightly larger than T Rex. Lower jaw finding: MUCPv-95 Found in 1988. Based on MUCPv-Ch1 & MUCPv-95 together: length 12m - 13m, weight approximately 8 tons. It lacked 28 millions of years of "additional evolution", compared to T Rex. The brain was only half as big as T-rex (or even only 1/3), even though the mass of the dinosaur was (somewhat) larger. The teeth were slightly shorter and certainly narrower, and it's skull was more "slender". of T-rex were practically useless in a hypothetical "fight" between the two animals. two animals. Note how both bodies are almost horizontal, balanced by the large tails. his head was slightly oriented upwards, due to the overall physiology of the animal. Both skulls are gigantic ofcourse. However, there are some differences. T Rex teeth and jaws, seemed to be "optimized" for a horrible bite at it's victim, deeply crushing bones and tissues. Giganotosaurus it's jaws and teeth, althoug impressive, seemed to be more optimized for slice and dice. I would not be surprised when (an individual) Giganotosaurus used several blows on a medium sized victim. Giganotosaurus it's skull, is estimated to have length from about 1.53 m to 1.95 m.
The largest known Tyrannosaurus T Rex skull measures up to 1.5 m in length. possibly the most powerful biteforce that can be attributed to a land animal. Fig 2. 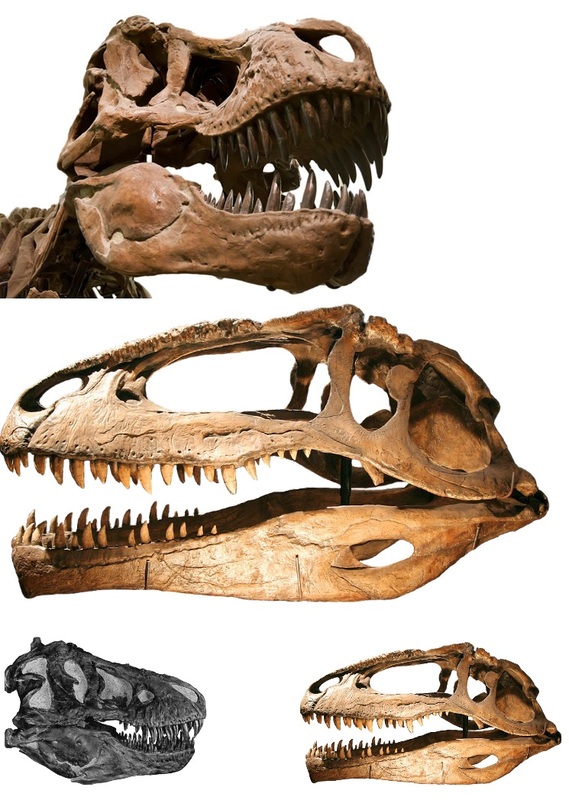 Comparison of the skulls of T Rex and Giganotosaurus. I think that this fact will not help Giganotosaurus in a "hypothetical fight" with T Rex (yes..., text for 8,9 years old, like me). to put almost all your weight into the blow, like T Rex could do. 3. Conclusion (if at all possible). No, it's not possible, really. We have seen some facts on both animals. The question was: who was strongest? It's a silly question, but still an interesting one, I think....(I hope, actually). I don't know the answer, ofcourse. Giga would have a certain chance measuring up to T Rex, especially if it indeed was 14m and 8 tons. Who knows? Ofcourse the animals were seperated by at least 28 millions of years, but maybe, in a "hypothetical encounter"
But all in all, I think (but not fully convinced) that I would put my bets on T Rex. Remark 1: Were females bigger that male TRexes? The 'robust' morph can be identified as the female TRex. were actually responsible for the different morphs. at "Naturalis" (Leiden, The Netherlands). Yes..., Trix is a "real" one, and not just some replica. compared to many other specimens. 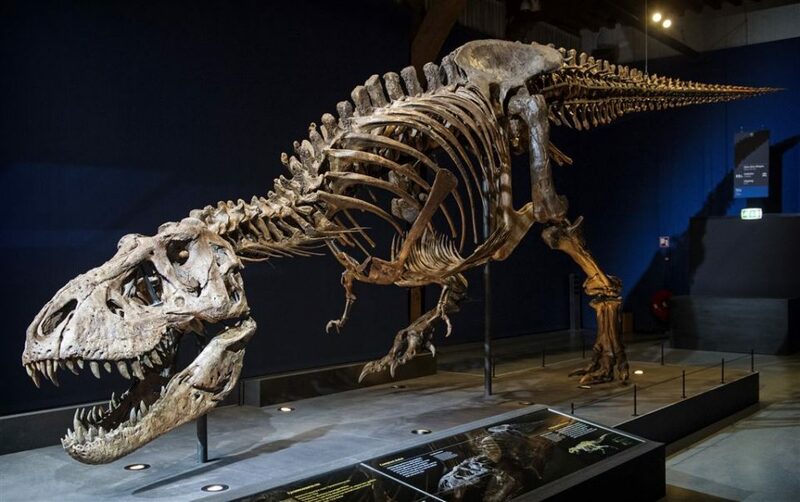 "Trix" is estimated to have had a length of 12m to 12.5m, and she is a tiny bit smaller than Sue. In the restoration proces, some slightly rescaled parts of Sue served as an example for rebuilding "Trix". By the way, Trix refers to "Beatrix", who was the former Queen of The Netherlands. Recently, I have visited "Trix", and it was absolutely fantastic. But that was to be expected from a TRex fan. TRex "Trix" at display in museum "Naturalis" (Leiden, The Netherlands).